Alonzo King LINES Dance Center is open to the public, offering more than 80 classes a week for adults who want to challenge and inspire themselves through dance. Our classes and workshops are taught by professional dancers and choreographers in the vibrant LINES Ballet studios. 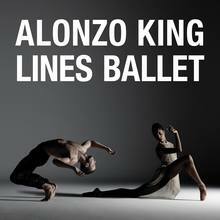 Since 1982, Alonzo King's LINES Ballet has championed extraordinary dance in San Francisco. The company has received international recognition for its choreographic innovation, unusual collaborations, and brilliant dancers.